Wandering around crowded streets in Hanoi, you cannot miss the simple but unique xích lô (cyclo) which has been a familiar means of transportation for almost a century and become an indispensable part of the character of Hanoi. Simple as it is, the beloved three wheeled vehicle has not only cemented ties between many generations of Hanoians, has also won the love of foreigners. Taking a cyclo tour around the 1000 year old city is an interesting and enjoyable experience for all. You feel free sitting in the colourful cyclo relaxing, taking in the sights and observing the bustle and noise. “It’s very exciting to get around Hanoi by cyclo”, said Philip Samar from France. “You are sitting in front of the driver yet separated from the crazy traffic”. 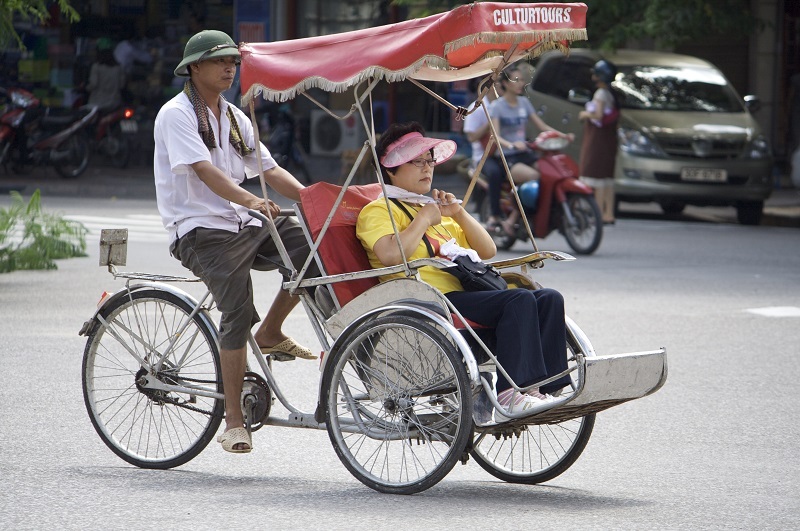 The leisurely rotation of the cyclo’s wheels will bring you through the 36 ancient streets of the Old Quarter, past tree-lined roads, big French style colonial houses, ancient Vietnamese buildings and temples, as well as charming lakes and other cultural and historical sites. The cyclo squeezes into every corner of the capital to show you the peaceful life of the old days and also bring you vivid sights of Hanoi streets with friendly smiles from local people and street vendors that normally go unnoticed when riding a motorbike. The word ’xích lô’ was actually borrowed from the French during the colonial period but has been around in Hanoi for so long time that local people consider it Vietnamese word. Since that time, the cyclo has been one of the primary modes of transportation in the city as well as a tool for labourers to earn their living. Nowadays, the rudimentary and simple Xich Lo is honored and loved by not only Vietnamese but foreign tourists as well. It is now mainly for tourists in Hanoi but its cultural beauty will increasingly valuable over time. However, the ancient Hanoi is not the only tourist spot that cyclo is a favorite chosen transportation, Ho Chi Minh City is also a place that you can easily find a cyclo with the driver, who can also be your professional guide, for an unforgettable tour around the city.